Hello all! My family and I went on a trip of a lifetime to New Zealand this summer and I was informed that it was going to be pretty cold. I’ve had the same bright pink winter coat for as long as I can remember. It was irredeemably grubby and definitely due an update. After a couple of coat shopping trips I just couldn’t find what I wanted, which was something warm, roomy enough to fit a fair few layers underneath and with a good hood. The obvious solution, was of course to make my own winter coat. This was obviously quite an involved project. It involved technical fabric that had to be worked with in a very specific way, a lot of pattern pieces and a couple of new to me techniques that I had not tried before. Of course I procrastinated to my hearts content, leaving it until 2 days before the flight to get cracking. It wasn’t an easy project. 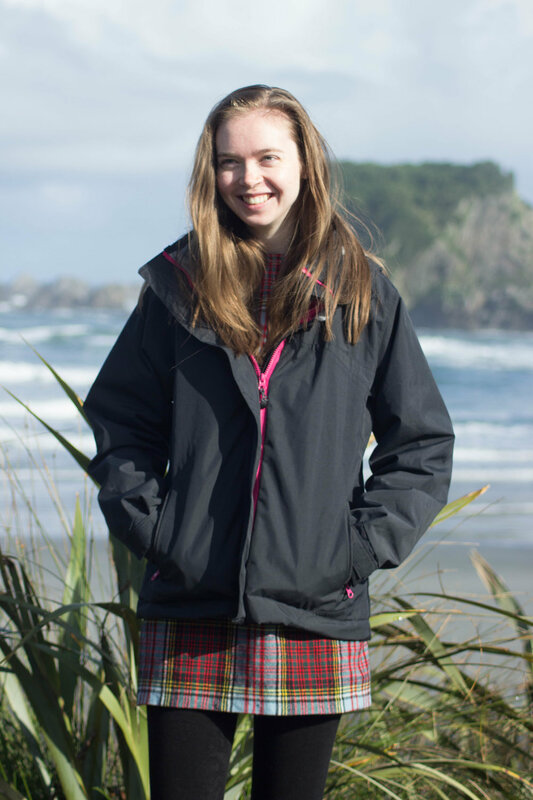 There were tears and a couple of minor strops, but I’ve worn this coat pretty much every day since it got cold here, plus it was invaluable when we were in New Zealand so I’d say that it was worth the aggro. Given the time frame that I was under, and how much I loved the fit of my old coat I decided that the best port of call was to cut up the old coat and use that as a pattern for my new one. I saved the quilted lining and the zips from the old coat because they were still perfectly usable, which saved me a fair bit of money and time. The fabric for the outer is a Cordura I found at Extreme Textiles for 25 euros a metre. I think I ordered 2m and just had enough? It’s waterproof and windproof whilst still being breathable which seemed like pretty ideal qualities for a waterproof coat. I also ordered some waterproofing tape from them so I could tape all of the seams after they were sewn. Black is a bit boring, but it’s nothing if not versatile. If I’d been able to source some different colours it would have been a great opportunity for colour blocking, but alas, not this time. The first task was to look at my existing coat and note all of the design lines. I then drew a very rough sketch of the coat and numbered what would become each individual pattern piece. These numbers were then written onto the actual coat that I was cutting up so I could keep track of what was what. You can see below that excluding the hood and the lining there were already 20 pattern pieces. When my old coat was unpicked down to each individual piece these were then traced onto card, which I then used as a template to cut out my new coat. Then it was time for the actual sewing to begin! The first step was actually the most intimidating part, which was the zippered welt pockets in the front of the coat. I wish I had sampled these first because I’d never tried this technique before and had to redo them a couple of times to get them right. Then it was just putting all of the pieces together and topstitching all of the seams down. Another technique that I copied from my old coat was the elasticated cuffs with a velcro tag so you can adjust the width of the cuffs depending on how bulky a jumper you are wearing. Well worth the extra time. Other notable features include the hood which is super cosy, but I wish that I’d made it just a bit bigger. All of the seams were waterproofed with an iron on seam tape which took a fair while to do, but considering that time, effort and money that had gone into the make I wanted to do it properly. I used a press cloth when ironing and used a low heat. So that’s my new coat! It’s honestly the biggest workhorse in my wardrobe. It’s definitely got its wobbly bits, but I can confirm that it’s waterproof, so really what more can you ask of it. I think that the seam details that I spent so long on do get a little lost due to the large expanse of black but at least it makes the large expanse of black that little bit more interesting. Thanks very much for reading and to Edward for the photos!